Named for the large ear tufts that extend above the head. The tufts are not really ears—most likely, they act to camouflage the bird by breaking up its outline amidst tree branches. Other names: Cat owl, lesser horned owl, Wilson’s owl. Hunting habits: This owl hunts strictly at night. Its prey is mice, rats, shrews, moles, bats, squirrels, chipmunks, pocket gophers, young rabbits, quail, grouse, jays, starlings, other birds, beetles, other insects, frogs, and small snakes. Nesting habits: Nests in an old squirrel or crow nest, usually 10-40 feet up in a pine. It takes 26-28 days for the eggs to hatch, and the young first fly at about 34 days. 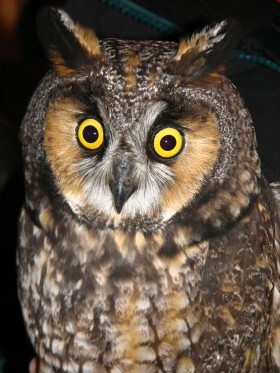 Life expectancy: A banded Long-eared Owl in Germany lived to 27 years, 9 months. One in America survived 9 years.